Global Reconciliation is building an archive of interviews on 'Talking Reconciliation'. What is the individual experience of people and their interpretation of the reconciliation process? For more info see our Resources page. The Symposium on Dialogue, Reconciliation and Conflict Transformation at the Institute of Peace and Conflict Studies (IPCS), University of Hargeisa, Somaliland, the East Africa University IN Bosaso, Puntland, Somalia and Mogadishu University, Bosaso, Puntland, Somalia. The symposium, teaching and workshopping peace and reconciliation techniques to young Somalis, was broadcasted by 4 of the main Somali TV networks. In January & February 2016, Dr Yusuf Sheikh Omar and Dr Kadhijo Osman undertook three more training courses following on from the previous year. In 2015, Global Reconciliation in partnership with the Somali Youth Peace Project and Mogadishu University delivered a community based dialogue: Training on Peace Capacity Building for Young Somalis Living in a Fragile State of Somalia. Dr Kadhijo Osman awards the Symposium on Dialogue, Reconciliation and Conflict Transformation certificate at East Africa University, Somalia, Thursday, 4 February 2016. Symposium on Dialogue, Reconciliation and Conflict Transformation graduation ceremony at East Africa University, Somalia, Thursday, 4 February 2016. Somalia has been a failed state and without a central government for many years, resulting from a prolonged and devastating civil war. War has traumatised Somali society, and destroyed its national institutions, infrastructure, social foundations, positive ethos, communal trust, community spirit, solidarity, sense of hope and prevented meaningful dialogue. Somalia's youth have grown up in a country where violence is the norm. This, combined with poverty and the complex problems of a post-conflict society has resulted in a large number of disenfranchised youth who are vulnerable to recruiting by extremist and criminal groups. ► To transform perceptions and behaviours of young Somalis in constructive ways through meaningful dialogue and peace training. ► To develop a culture of harmony, positive social engagement, negotiation and conflict resolution skills among Somali youth. ► To develop participants' capacity to understand the root causes of social problems and identify relevant solutions. ► To develop a strategic plan on reconciliation and peace capacity building among young Somalis. In 2014 Global Reconciliation initiated a series of meetings in Melbourne with Islamic and other community groups calling for an alliance for community harmony. A successful pilot forum attended by representatives of many groups, including Islamic organisations and youth workers, was held in a Christian Church in Melbourne. Global Reconciliation will extend the forums to Brisbane and Sydney in 2015. The forums begin by posing the question of what it means to live with different public signs of faith— extending from ways of dressing to styles of architecture. 'Being Australian, the Muslim Way' addresses tensions in the Australian community over cultural and religious differences, bringing together wide cross-sections of community members across three cities to examine the challenges to mutual understanding and cohesion. The project will produce a series of short films, a set of reflections by ordinary Australians about their vision for Australia's future, and key public events continuing personal interactions through sharing of food, culture and sporting interests. Ancient Cultures, New Futures is a traveling photographic exhibition that seeks to contribute to the much-needed process of healing by supporting dialogue and reconciliation across the boundaries of continuing difference. Rather than focusing on the familiar images of war, destruction and personal suffering, or on post-war reconstruction and the growing level of material wealth in Sri Lanka, it seeks out ambivalent images that encapsulate both the challenges facing the country and the hopes carried by all for a different kind of future. The exhibition is an initiative of Global Reconciliation and Initiatives of Change, in partnership with key figures of the Australian Sri Lankan community. It brings together works donated by photographers Stephen Champion, Paul James, Dominic Sansoni and Sivathas Sivasubramanium, and seeks to press further the challenge of reconciliation, within the Sri Lankan communities both in Australia and in Sri Lanka itself. The photographs carry the weight of the past — negative and positive — but also speak of warm encounters, creative confrontations, and powerful new possibilities. The exhibition is organized around the all-pervading presence of the physical and cultural beauty of Sri Lanka, of the trauma to which all — old and young — have been exposed, and on the struggle to emerge triumphantly from the past of sadness and pain. Four themes form its structure: the all-pervasive, rich and diverse, ancient culture; the unfinished, sad and poignant legacy of the conflict; the determined re-establishment of everyday life; and the struggle for a world of renewed hope and shared achievement. Ancient Cultures, New Futures was launched in August 2014, with further exhibitions scheduled in the following years in North Melbourne and Dandenong, viewed by some 2,000 people. Each exhibition held community workshops to discuss reconciliation and ways forward for Sri Lankans, filmed and published on Youtube. A book of the exhibition, its implications and outcomes, is being published. 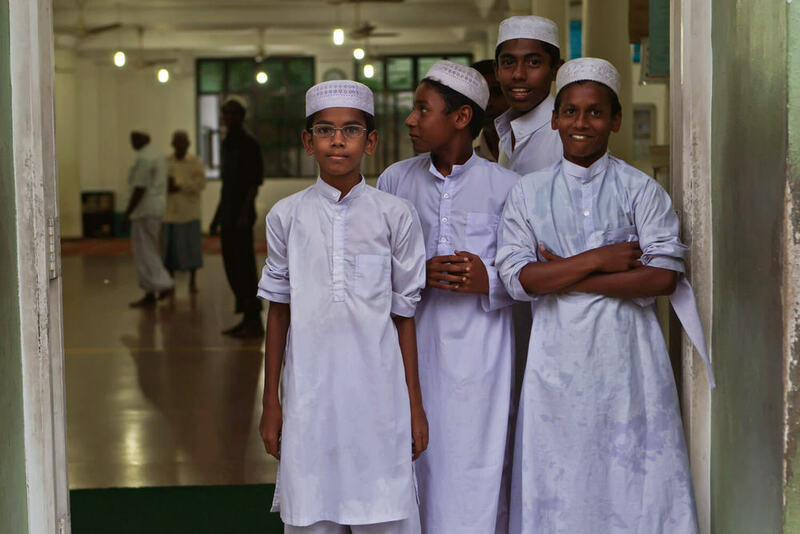 Boys stand at the entrance of the Madhrasathul Noor Islamic Religious Institute in Megawatti Street, Colombo, Sri Lanka (2011). White is the colour of purity. 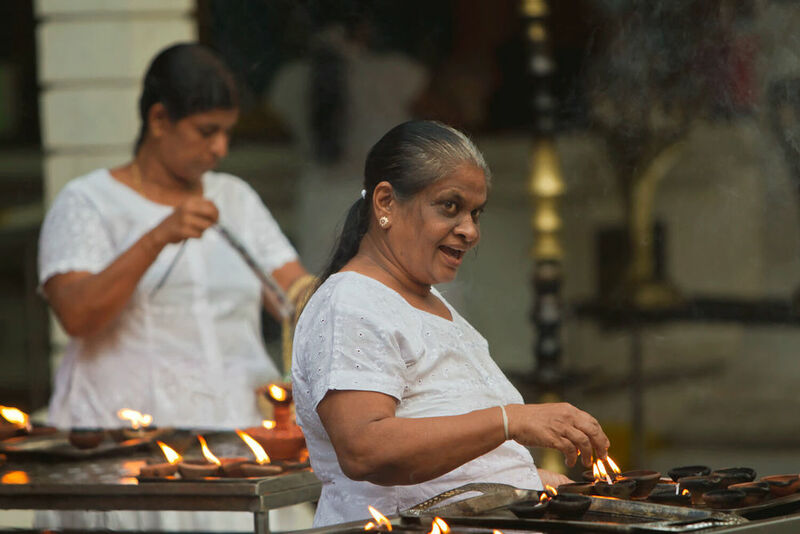 Women light candles at a Buddhist temple in Colombo, Sri Lanka (2011). It is said the flame of one candle can light a thousand candles. A Muslim man threads a sewing machine in a workshop in Megawatti Street, Colombo, Sri Lanka (2011). A girl and her mother sit with friends in the Mutuwal informal settlement, Colombo, Sri Lanka (2011). The girl sits on a rug, surrounded by learning materials. The Venerable Batapola Nanda Thero and Professor Suresh Sundram stand in conversation at the first national postwar reconciliation forum in Sri Lanka. This forum was organized by Global Reconciliation (2012). 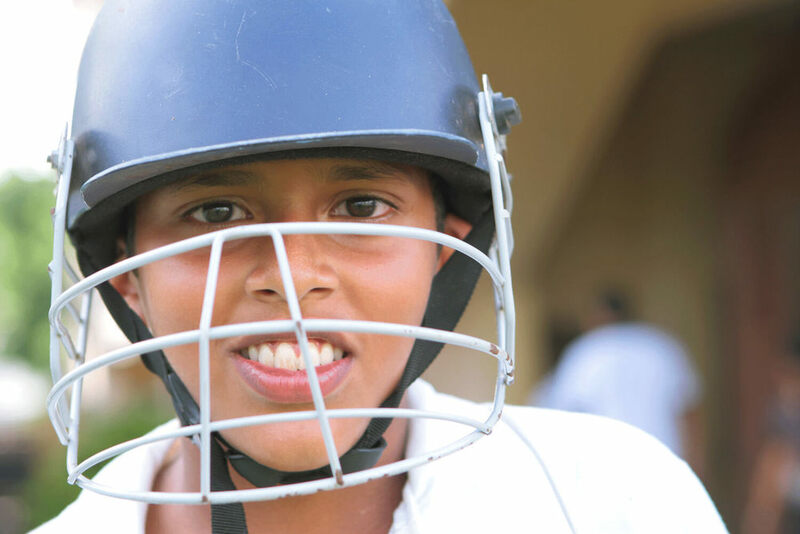 A student cricketer puts on his gear at a Global Reconciliation sporting clinic in Colombo, Sri Lanka (2010). Brothers play in the grounds of the Foundation of Goodness preschool, Seenigama, Sri Lanka. The backdrop features both Sinhalese and Tamil script. A child with Buddhist background plays with others at the Foundation of Goodness preschool, Seenigama, Sri Lanka, framed by a mural of the Christian story of Noah’s Ark (2010). There are many different stories about the beginning of the world, and she knows them. 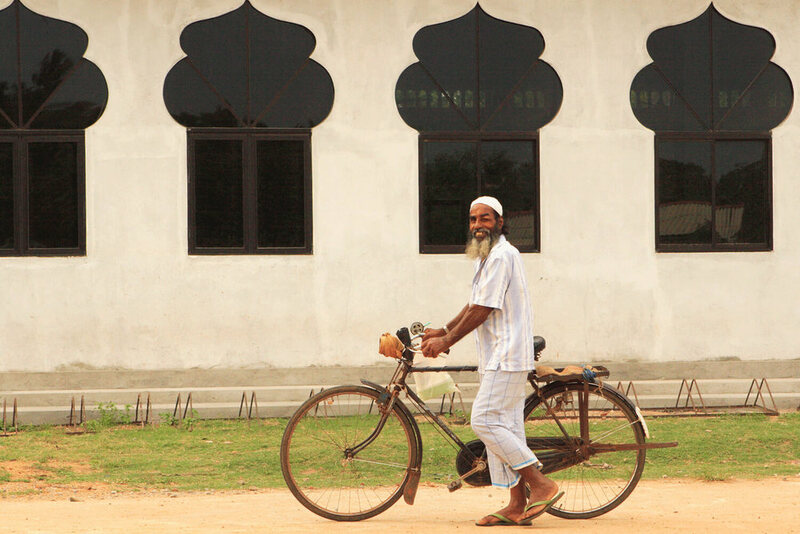 The mosque in Hambantota, Sri Lanka, has controversially been rebuilt in the no-rebuild zone after the tsunami. The community effort brought together Muslims, Buddhists, and Christians (2010). A man sits in a derelict building opposite a mental hospital. The area used to be a restricted Sinhalese military zone in Jaffna, Sri Lanka, where he previously could not have gone (2011). Dancers from the K Barthy Vidyalayam School, Sri Lanka, preparing to welcome a Global Reconciliation delegation from Australia (2011). A man walks to work on an ordinary day in Kandy, Sri Lanka (2011). Not far away in a common compound, both Buddhists and Muslims worship in an interconnected temple and mosque. Boys play basketball in Kilinochchi, Sri Lanka (2011). One of the boys was previously reviled as a homeless outsider. 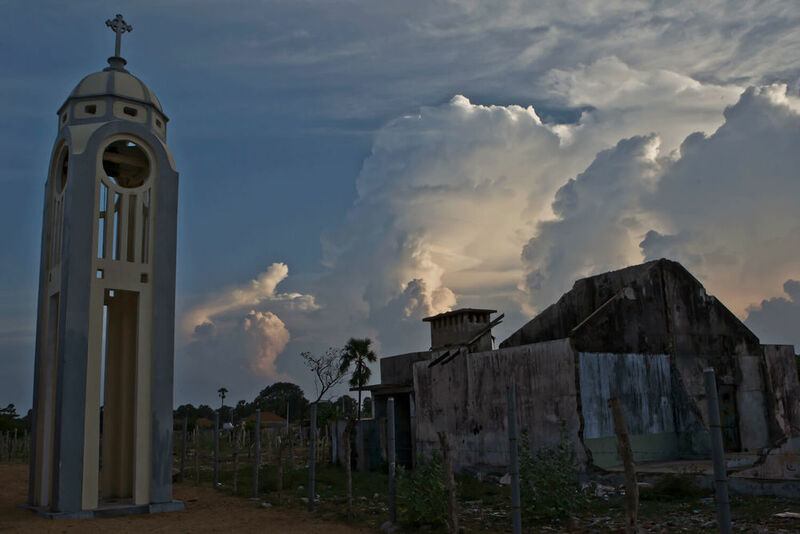 Mullaitivu Church, Sri Lanka, where hundreds of people were killed in the 2004 tsunami (2011). Sivathas Sivasubramanium walks on the Mullaitivu-foreshore, Sri Lanka, part of the Global Reconciliation deep end journey (2011). Boys talk to each other at the Oddusuddan School near Mullaitivu, Sri Lanka, (2011). They remember a period when they and their parents fought in a war. Girls wear the uniforms of the Oddusuddan School near Mullaitivu, Sri Lanka (2011). In an earlier period, they wore the uniforms of a war that began before they were born. A woman and her son inspect a bombed-out house on the road to Jaffna, Sri Lanka (2011). Adam Goodes, 2014 Australian of the Year, talks with the local cricket coach in Seenigama (2010). The language of sport crosses all boundaries. Vedda Chief Uruwarige Wannila Aththo meets a reconciliation delegation in Dambana in the Badulla District (2010). The Vedda people are indigenous to Sri Lanka, and lived there long before the ancestors of those who fought the civil war first came to the island. Reconciliation needs to take many paths. The son of the Vedda Chief in Dambana in the Badulla District (2010). Youth hold the promise of the future. The International Health Workforce Society of Australasia (IHWSA) is a coalition of health professionals and representatives of professional, educational, research and international aid organisations which seeks to promote and enhance coordinated health care development assistance from the Australian community. In a project funded by the Department of Foreign Affairs and Trade, Global Reconciliation partnered with the Burmese Medical Association Australia and brought thirteen key Myanmar healthcare workers to Australia for a four week program to develop a unified policy towards HIV control in Myanmar. To address the lack of coordinated discussions between government, NGOs, community organisations, and other representative groups in Myanmar, the program was structured according to three major streams: health, law and fiscal governance. This was Phase 1 of an ongoing project which aims to develop health-related cooperative engagement by: conducting joint activities; engaging minority groups in decision-making processes and legislation to promote HIV health policies (including harm reduction); and using fiscal governance to improve Myanmar’s health crisis. The difficulty of reconciling tensions in Papua New Guinea is compounded by the complexity of different and intersecting ways of life in that country. Customary tribal practices and meanings compete with traditional Christian cosmologies and modern development possibilities. Each of these could have a negotiated place in the future of Papua New Guinea, but presently they are the source of considerable conflict. This project, initiated in 2004, and marked by the publication of Sustainable Communities, Sustainable Development in 2012 (University of Hawaii Press), links local research and community-based learning about alternative development strategies. Our overriding concern is to work across the complex tensions—both destructive and creative—presented in the intersection of ontologically different formations or ways of life. How can people in their everyday practices—including migrant settlements and urban villages, rural and customary communities—negotiate the living legacies of tribalism, the continuing influence of a colonial heritage, the intensity of different proselytizing religions, and the contemporary challenges of massive mining development? This for us is best done through ‘both-ways’ politics. That is, alternative development strategies entail critically holding different ways of life together in relation. Both-ways politics, in our view, entails not just advocating another modernity but a lived reconciliation between ontologically different ways of doing things. Reconciliation in this sense does not mean collapsing different life-ways into a single harmonious whole. Even a Melanesian version of a singular ‘modernity’ would be problematic. Rather we are talking about the importance of living with and negotiating what James Tully has called ‘strange multiplicities’. This work has had practical effect in supporting the establishment of learning centres across the country that take seriously both customary knowledge and modern analytical expertise. Family selling vegetables at Koki market, Port Moresby. Karasevdah: Srebrenica Blues is a story of Australian reconciliation. Karasevdah is a journey through memory, an intimate and loving dialogue with the landscape of his birthplace, drawing the breath of beauty and life from it, seeking to move out from the shadows of the past to embrace new futures. The parallel between the tasks facing the survivors of Srebrenica and the challenges still confronting indigenous people around our country is striking. After watching the film, indigenous leader Professor Marcia Langton AM, Chair of Indigenous Studies at the University of Melbourne, said: “…I was reminded of my own historical burden… While a very personal statement about love and attachment, it answers the terrible question on the lips of far too many people who have experienced loss and suffering: how can we overcome this intimacy with death and learn to see the beauty and joy in the world?". Karasevdah is a film by Saidin Salkic and was produced with the support of Professor Paul Komesaroff and launched in 2007 by Global Reconciliation, with Professor Marcia Langton AM and Professor Richard Larkins AO, then Vice Chancellor of Monash University. In August 2012, Global Reconciliation with friends and members of the Australian Sri Lankan diaspora successfully brought together more than 80 individuals that represented an inclusive range of Sri Lankan organisations, religions, views and opinions — some inevitably conflicting with others — for a workshop in Colombo, Sri Lanka. The workshop was the first step in the establishment of an open, growing coalition equipped with a range of model ways of working together at the community level to develop the possibilities of a peaceful, trusting and prosperous society. Global Reconciliation Exchanges are carefully designed and managed learning exchanges that aim to provide opportunities for local communities from different global contexts to share personal and professional knowledge and experience around how everyday practices can serve as vehicles for social inclusion and reconciliation work at the community level. The three sport focused exchanges to date have combined the long term reconciliation work of Global Reconciliation (through partnered projects with RMIT University, Monash University and the University of Western Sydney) with Bluestone Edge’s concept of the Deepend Journey. In October 2013, a group of 18 Australians, including professional athletes, sport-for-development professional and researchers travelled to Rio de Janeiro to participate in an eight-day sport focused Reconciliation Exchange organised by RMIT University, Bluestone Edge and Global Reconciliation and hosted by the Brazilian Institute for Innovations in Social Health (IBISS), an NGO that has been carrying out social inclusion and reconciliation work in dozens of favela (shanty town) communities in Rio since 1989. The exchange was undertaken with the participation of Richmond Football Club (a team within the Australian Football League – the highest level professional competition in the sport of Australian rules football), and the Korin Gamadji Institute (a prominent Australian Indigenous sport and education pathways organisation. Brazil - Australia 2013: Changing the Score was conducted as an action research project model with the aim of documenting and evaluating the Reconciliation Exchange model. ► Empowering those who have experienced conflict. ► Enabling others who have sought to move societies away from conflict. ► Drawing out everyday activities where people can come together and work, through grief and beyond hostilities.